Model-builder Spaceruner has been around the online LEGO world for years putting out updated or re-imagined versions of classic sets. 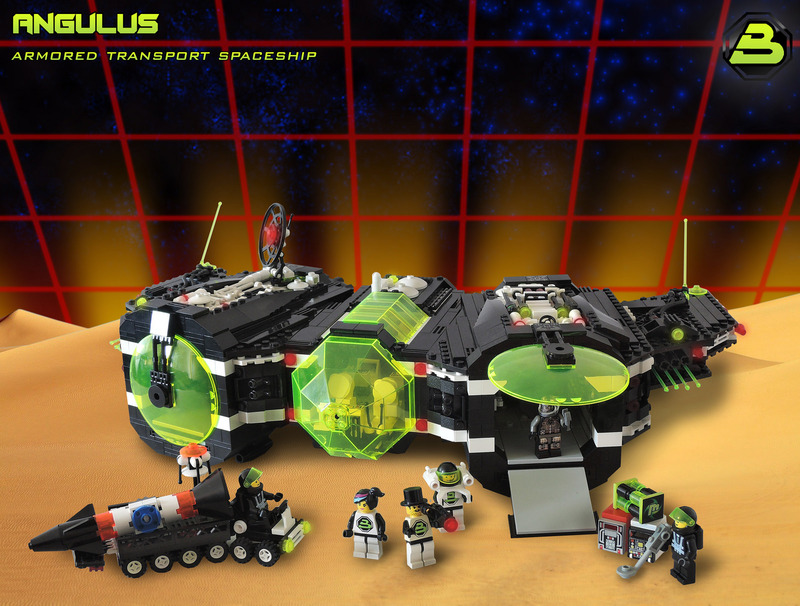 His latest model is the Angulus, a unique twist on the old Blacktron II LEGO theme (and is in a lot of ways an evolution of his older Piranha model). Many of the usual Blacktron II staples are here: the contrasting black and white color scheme and octagonal trans-neon-green cockpits foremost. What I appreciate most about this model is how modern it feels without feeling obligated to shove a bunch of newer parts into the build: most old-school LEGO fans of the 80s and 90s could probably duplicate the majority of this creation if they still have their childhood buckets of bricks. We previously featured Spaceruner’s gigantic RX1 Behemoth, a truly massive tribute to the old Spyrius line.